These two Arlington County staff members were presented with an award on Aug. 30, 2018 in Philadelphia. This was in relation to Community Broadband and Digital Equity Innovative Partnership for the County’s Digital Inclusion Initiative that will deliver the free internet access to over 150 Arlington students living at Arlington Mill starting this fall (along with computers and training). Arlington is the No. 1 digital county in the nation for a second straight year. The Center for Digital Government and National Association of Counties 2017 award recognizes Arlington for its best technology practices in areas of open government, transparency, citizen engagement, cyber security and operations. Arlington received the highest award for counties in the 150,000 – 249,999 population category based on its submission to the Digital Counties Survey. The Center for Digital Government and National Association of Counties has named Arlington the No. 1 digital county in the nation for its size. 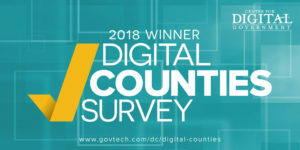 The Digital Counties Survey for 2016 recognizes Arlington’s best technology practices in areas of open government, transparency, citizen engagement, security and operations. A top-ten finisher in past years, this is the first time Arlington has received the highest award for counties in the 150,000 – 249,999 population category. Arlington is ranked one of the top ten in the Center for Digital Government’s 2015 Digital Counties Survey. The award recognizes leading examples of counties using information and communications technology. The Digital Counties Survey is conducted in partnership with the National Association of Counties (NACo) annually in the spring: March-April. All United States counties are invited to participate in the survey, which examines the overall technology programs and plans of the county. The awards are presented during NACo’s annual conference held each July. Cartegraph recognized Arlington County’s Department of Environmental Services (DES) with its 2015 Excellence in Operations Management Award. DES began using the Cartegraph system last year to deploy integrated, user-focused technology support to its many business needs. The award celebrates the most forward-thinking, efficient organizations in local government. It honors organizations who use modern technology to solve problems, work smarter and improve their communities. Arlington is ranked one of the top ten in the Center for Digital Government’s 2014 Digital Counties Survey. The award recognizes leading examples of counties using information and communications technology. “The Digital Counties Survey identifies best practices and innovative uses of technology crucial with today’s constrained budgets to maintaining and even improving service levels,” said NACo Executive Director Matthew D. Chase.